"Alone or away the love that blossoms shall not wilt away." "Life is the way you share love, love is the way you see the life." "Look for the love that never give over Be the heart that never fills." "Eyes alone can't give you sight But the wholeness will." "Your sanity your respect and your obedience are not much deeper than your skin 'pretend because you need'." "A seed seeks soil to become a flower. Love seeks trust to become forever. "Not every seed blossoms. Not all clouds rain. You are here for a specific reason but not everyone knows it." "Don't be upset of closed doors; It's so because it leads you Nowhere." "Buds turn into flower by the essence of light. Her glance turns my numb heart into brightful ruby." "We better learn not to control warheads but our own mind..."
"Life is a game that the rich play well and suffocate the lean." "Being alive in every split of a second is the highest degree of awareness ever a man can achieve." 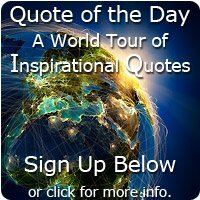 Simply click here to return to Publish Your Quotes.